Non-motorized transportation, particularly including walking and bicycling, are increasingly becoming important modes in modern cities, for reasons including individual and societal wellness, avoiding negative environmental impacts of other modes, and resource availability. Institutions governing development and management of urban areas are increasingly keen to include walking and bicycling in urban planning and engineering; however, proper placement of improvements and treatments depends on the availability of good usage data. 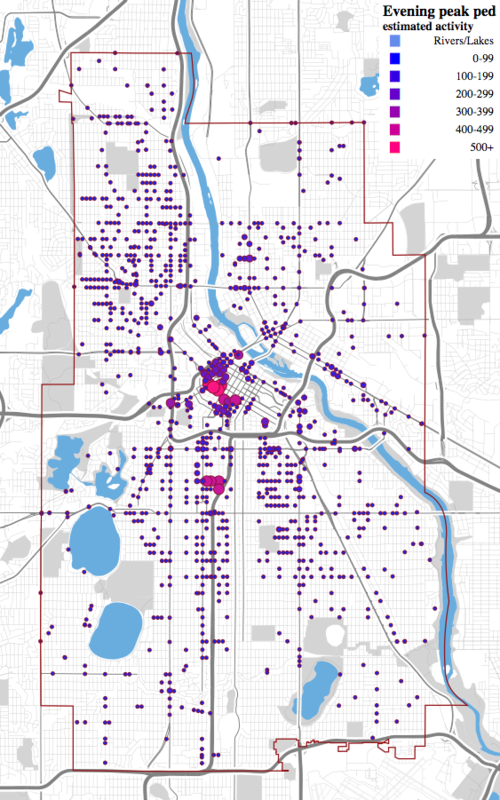 This study attempts to predict pedestrian activity at 1123 intersections in the Midwestern, US city of Minneapolis, Minnesota, using scalable and transferable predictive variables such as economic accessibility by sector, betweenness network centrality, and automobile traffic levels. Accessibility to jobs by walking and transit, automobile traffic, and accessibility to certain economic job categories (Education, Finance) were found to be significant predictors of increased pedestrian traffic, while accessibility to other economic job categories (Management, Utilities) were found to be significant predictors of decreased pedestrian traffic. Betweenness centrality was not found to be a significant predictor of pedestrian traffic, however the specific calculation methodology can be further tailored to reflect real-world pedestrian use-cases in urban areas. Accessibility-based analysis may provide city planners and engineers with an additional tool to predict pedestrian and bicycle traffic where counts may be difficult to obtain, or otherwise unavailable.